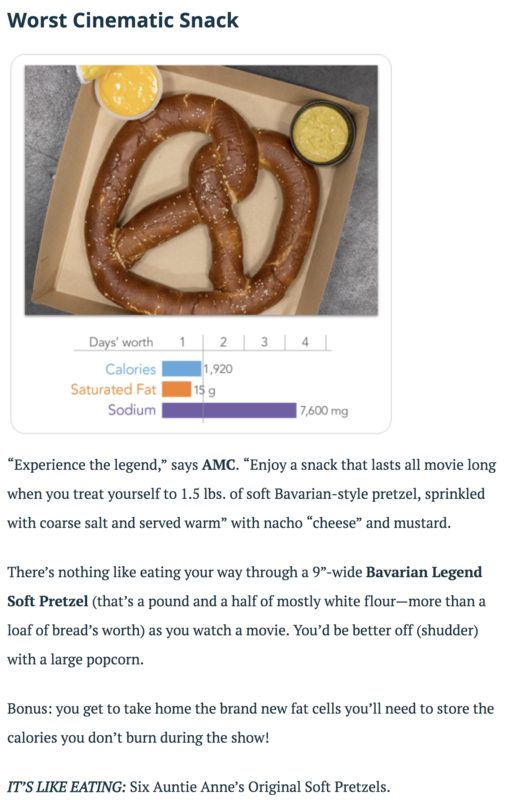 The Center for Science in the Public Interest (CSPI) has given out its Xtreme Eating Awards for 2018, and, I found some of these beyond belief. Now if you’re a regular here you know that I occasionally eat large meals, especially on vacation, and sometimes food considered “bad”, like rib tips and fries. But more often I eat healthier, and am doing so even more since I started fasting two days a week (I have lost considerable weight and am considering cutting back on the fasting). Today, for instance, I had a latte with 2% milk for breakfast, a salad and an apple with lunch, and tonight I’ll have an omelet with green peppers and some baguette, as well as a glass of decent wine. But if I couldn’t binge out once in a while, I’d consider life not worth living. That’s not easy. After all, a typical restaurant entrée has “only” about 1,000 calories. That’s one reason why “only” two out of three adults and one out of three children or teens are overweight or obese. But these dishes go the extra mile…just so more of us can start looking for extra-large-size apparel. Now, some of my guilty pleasures: An entire pint of Ben & Jerry’s ice cream (I haven’t done this for a while), the large rib tips with mild sauce and fries at Uncle J’s BBQ on 47th Street (eaten as two meals), the giant Costco apple pie (eaten in about six goes). I believe it was A. J. Liebling who said his aspiration was to think, on his deathbed, that “There have been kings who haven’t eaten as well as I.” And that’s the way he went! This entry was written by whyevolutionistrue and posted on July 29, 2018 at 12:30 pm and filed under food and drink. Bookmark the permalink. Follow any comments here with the RSS feed for this post. Both comments and trackbacks are currently closed. The cardboard box taste better than what’s inside and it comes with a side of bigotry. I have a saying that I tell all of my patients/clients. Ready? You will remember this the rest of your life! “You can NOT run a Corvette on kerosene!” A high power engine needs high octane fuel. “The engine will run only as good as the fuel you put in the tank.” The aforementioned offerings are not the optimal fuel for this human engine. There are just so many things wrong with that analogy! For example, modern engines will adjust their ignition timing to suit the octane rating of whatever gas you put in them. And a big V8 like in the Corvette is probably more tolerant of lower octane ratings than many smaller, more highly-tuned engines. I doubt you could run any modern car on kerosene, though. But what they do not need – but humans usually do – is a good variety of substances in their ‘diet’. The problem with human diets is not in eating the ‘wrong’ things but in eating TOO MUCH of the wrong things. And occasionally, not enough of the right trace compounds, like iodine and ascorbic acid. There is no one ‘optimal fuel’ for the human diet. I split one of those pretzels with a friend at a local beer garden last week. It was the only thing to snack on for someone who doesn’t eat sausages. They go quite well with Hofbrau. There is a food item that I’ve only ever found in St. Louis called the Slinger (not to be confused with a slider). The slinger is to be found in the greasiest of greasy spoons; best enjoyed as a capper on a night of drinking (not the next morning). Add cheese and chopped onions to taste. The combination of flavours sounds pretty good, but the amount of food is at least four meals for me – and that’s on a bad day! To tell you the truth, it coming at the end of a night of drinking usually helps with that. Many times in a diner eating this have I heard “I can’t believe I just ate that whole thing.” It is usually heard from thin girls who are pretty drunk. I never thought about it before but I’m now wondering how many of them keep it down permanently. Ha! Probably very few. A small stomach would probably usually revolt at a meal that size! You had me at eggs (with runny yoke, please) on top of hash browns. Then it all went very, very wrong. In spite of how it sounds, I assure it is awesome (unless you don’t like chili). I was in StL once for several days at a meeting. I associate StL with indigestion. A modest virtue of StarBucks is that they have the smallest apple fritters in the world. 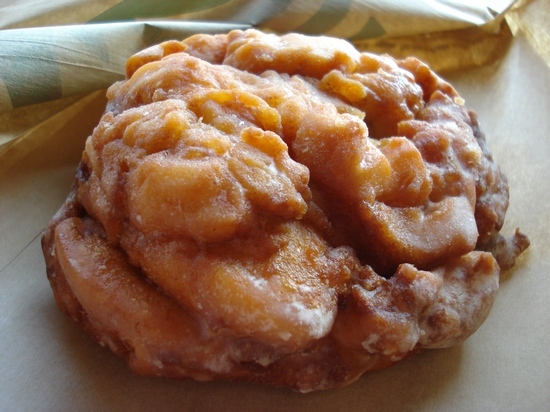 Other doughnut shops sell apple fritters that are enough to feed five or six people over a period of as many days. 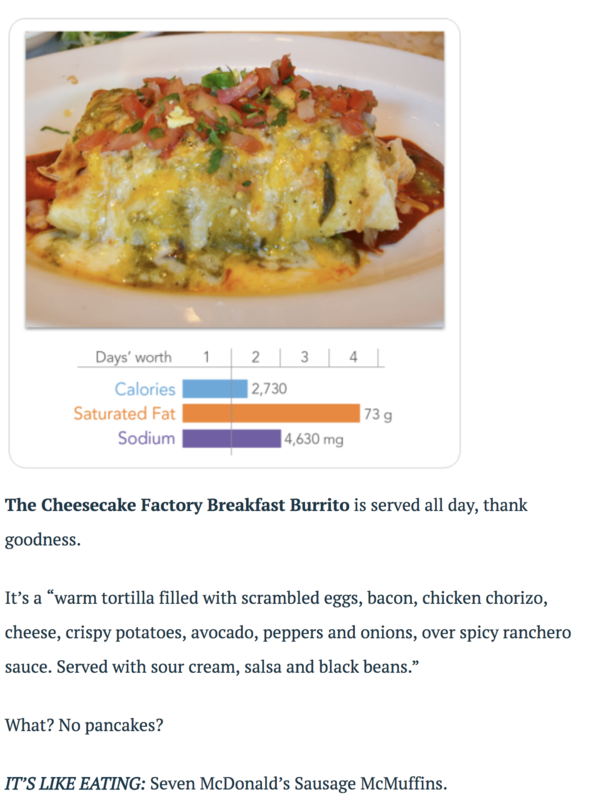 The Cheesecake Factory breakfast burrito should NOT be associated with seven mcMUFFins. I call blasphemy. Calorie counts do not make the entire analysis comprehensive. I would eat that breakfast burrito. The others? Nah. Although I wouldn’t be inclined to eat most of these meals, I have no respect for CSPI.Bonnie Liebman of CSPI circulated a letter demanding the BMJ retract an article ( by Nina Teicholz) criticizing the lack of evidence for the most recent us dietary guidelines. The CSPI advocates ignoring evidence based research in favor of unreliable epidemiology and possibly biased industry financed research. And what evidence does nina teicholz et al. rely on? The specific studies are on her website. I’m very impressed by the preliminary data from Virta, a company which provides treatment to diabetics. Most subjects reduced medication or reversed diabetes in less than a year. I don’t think there is enough evidence to say what an ideal diet is for any given individual. It is clear however that a diet low in saturated fat and high in carbohydrates and polyunsaturated fats is unhealthy for the vast majority of people. Wrong! Check sciencedrivennutrition.com, scienceofnutrition.com for a debunking of nina teicholz and gary taubes and sciencebasedmedicine.com. the scep doc, harriet hall, is also excellent at debunking the high fat enthusiast crowd. Dietary guidelines are based on sound scientific evidence. You know the same science that drives evolutionary law. Checked them and I’m very unimpressed. Nutrition science is in its infancy. It’s also complicated by the vegan agenda and food industry agenda. Perhaps we will know more in five or ten years. In the meantime, let’s agree to disagree. I haven’t yet checked the sources mentioned by dabertini, but will. Although not a nutritionist, I am, or have been, an avid cook, therefore, also a cookbook collector. I have read many books on diet and nutrition as well. I have a great deal of respect for the research and writing of Gary Taubes, Michael Pollan, et al. I will reserve judgment on the conflicts between nutritionists, dieticians, diet book authors, researchers like Taubes and Pollan, and researchers in the pay of the food industry and doctors. But, I’m more inclined to think we should cut down on (or out of) highly refined starches, sugars, salt,and hydrogenated oils. It wasn’t until we tried an Atkins-like diet (which is not “high fat”) that we were able to normalize my husband’s exceedingly high triglycerides after having tried other approaches recommended by our doctors, including a specialist, that didn’t work. I too am an avid cookbook collector and enjoy cooking and food writing. I have reached the conclusion that refined grains, refined seed oils,and sugar are unhealthy and I have pretty much cut them out. Giving up bread is very difficult though. How can things that are not alive be described as “unhealthy”, or, for that matter, “healthy”? Oy! I was going to eat soon. But everyone of those images, in the article and comments, gave me the shudders. Because they specifically do not look like food or, frankly, something that anyone would like to put in the mouth. Why is glazed sugars or fats put on what is nominally considered food? Agreed. The top one looked like an insinkerator had just barfed. Maybe it looks better in real life. I won’t say what the second one looked like. Call this a conspiracy theory if you like, but after all is said and done, the article has served as an excellent advertisement for each comestible. Looking at their article, I am reminded why they are called the food police. Tacos with a side of rice and beans. How terrible, there is beer as well. And some people can’t leave Yard House without its signature 32 oz. Half Yard of IPA. Now we’re measuring alcohol by the yard? Only for about three hundred years. Peanut butter caramel malt shake at Sonic, 2170 calories. This would normally be your ‘drink’ with a meal. It’s alright if drunk over a period of ten days. Here in Hendersonville, NC there is a place called “HenDough” – fried chicken and doughnuts. [They do serve the chicken on a biscuit, not the doughnut.] They are so successful they opened a branch in Greenville, SC. Sad thing is that the building used to house the best seafood restaurant in Hendersonville – they lost their chef and that was the end of them. I don’t see why anyone would object to rib tips. I used to love pancakes with my mother’s chicken gravy (from what I think is typically called Maryland fried chicken). I’ve been doing the intermittent fasting thing as well, and while it works quite well for weight loss/maintenance, it makes me feel so horrible that I think I’ll have to find another strategy. Not physically horrible, but psychologically horrible: vaguely crabby and unquestionably depressed. I’m not overweight, and I don’t like being depressed, so I’m kind of done with the fasting thing for now. I recently succumbed to ads for DNA testing and analysis while watching the Tour de France, so I’m going to see what my genetic makeup indicates for diet and nutrition strategies (you get a phone consult with a dietician as part of the analysis). Even if a low fat vegan diet is recommended, it will be better than fasting, AFAIC. They apparently missed the Beer-battered deep-fried cheeseburger at King’s. Note 0 comments on their page, presumably since the only reaction to the concept is speechlessness. A year ago, I lost 65 pounds on the diet that Penn Gillette of Penn & Teller used. Find it in his book Presto. I’m not sure high calorie and high salt foods are the cause of the obesity epidemic. Nutritional ‘science’ is still in it’s infancy, and there is a lot of woo around. One thing has -I think- been well established: low fat foods (in foods that would normally contain fats) are not beneficial, the fats are generally replaced by sugars, and sugars and starches are suspected (not established, but suspected) to be ‘obesogenic’. There is also the idea that even some additives and micro-doses of ‘obesogenics’ from packing plastics and the like may be involved. And then there is the intestinal flora, which is nearly certainly playing a role, which may be influenced by diet. The true answer is that we simply don’t know yet. There is also another well established one: if you drink a lot of beer on a daily basis you will get a belly, a cooler bag for your six-pack.